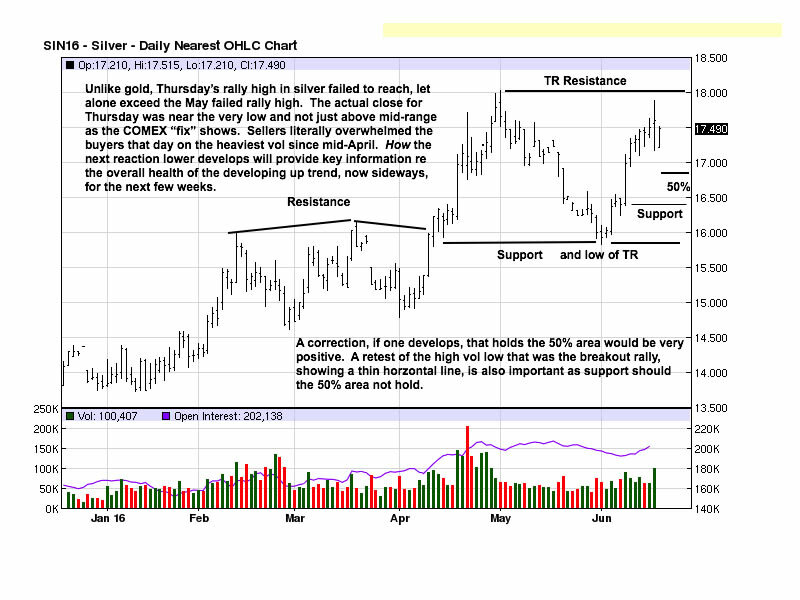 Gold And Silver – Insanity Is World “Norm.” Keep Stacking! mankind, gold and silver rule. 2. In a world where the elite’s have been ruling for the past few centuries, and where it has reached its tarnished zenith in present day, where greed and stupidity readily prevail over the uninspired masses, if you do not own gold and/or silver, you got nothing! Almost everyone who is a gold/silver advocate/purchaser follows the never-ending list of experts on the topic where one can learn all about supply and demand, how much gold or silver is being mined, where, who is buying, read all about purportedly empty vaults in the West that are not supposed to be empty, how many paper contracts there are chasing every available ounce known to exist. A lot of this information comes in colorful graphic charts, backed by endless statistics. While none of this information has depicted the current pricing for gold and silver, especially since the 2011 highs, what pragmatic purpose has all of this brilliant information served over the past five years? We remember saying, a few years back, when all the rage was to report the record number of gold and silver coins being minted and purchased in larger and larger numbers every month. In fact, they still get reported. Our thought was [all of this buying was from the public], when has the public ever been right, especially in one of the largest trading arenas in the world? 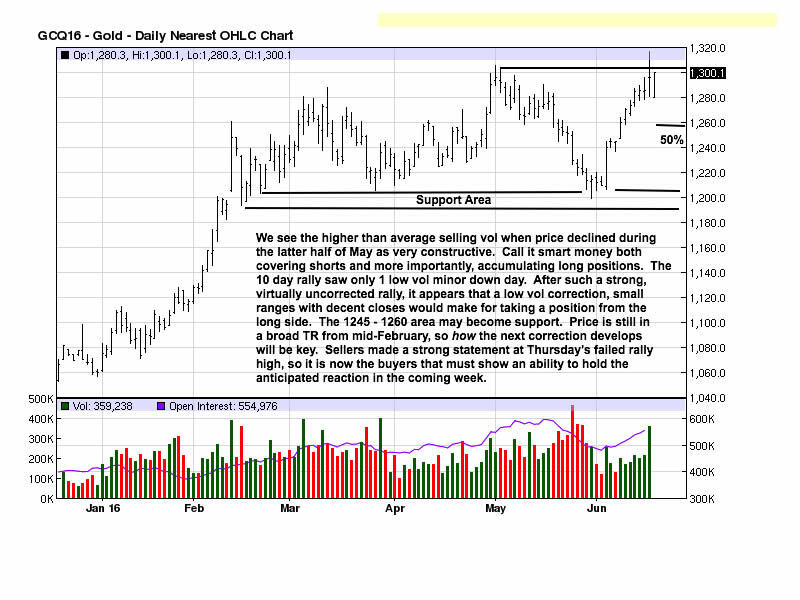 There are far better reasons to be buying and personally holding gold and silver, and price is the last consideration. More importantly, for now, is availability. Get either, or both, while you still can. This window of opportunity will close without warning. How, when, or even under what circumstances no one knows. The West, thanks to the Rothschild formula of burying nations, and their people, in debt that can never be repaid, remains in deep trouble. Debt for which interest is perpetually owed to the globalists, the moneychangers, is the source of all problems. [Follow The Money!] A fact that few people ever consider, for all of the endless fiat paper being created [digitalized, these days, physical paper is on its way out], none of the created money can ever cover the interest charged. Not a single cent, shilling, shekel, dinar, real, euro, whatever, can pay for the perpetually increasing interest. Assume the universe for all money in existence is $1 million, printed into existence by the world central banks and distributed to all the people, at 10% interest per annum. At the end of the year, there is interest in the amount of $100,000 due to the central banks. That interest is now in addition to the $1 million that exists. The central banks say that, at the end of the year, everyone must return their portion of the $1 million in existence, plus pay the agreed upon 10% interest. The question is, from where does the “money” come to pay the interest? It does not exist, but the bankers are demanding that it be paid. The bankers will create and loan out another $100,000 so all can repay the interest due and owing, but now, everyone is borrowing money that cannot be used for any other purpose than to repay the bankers. Greece is experiencing this without understanding the futility of it all. Italy, Ireland, Spain, Ukraine, Venezuela, Brazil, et al, actually the entire Western world is a financial house of fiat currency debt where the inability to pay interest keeps mounting, and in order to stay alive, financial speaking, just to pay the interest, every country is being forced into insolvency, giving up individual sovereignty, having to sell national assets for pennies on the dollar to the elite’s corporate squids devouring every country along the way. This is what happened to the United States in 1933, when this country was forced into bankruptcy by the moneychangers, yet to this day, it remains a “secret” from the people by those in charge. quorum to maintain the government. Lincoln kept the situation alive by taking over the country via Executive Order, acting under the rules of war and the laws of necessity, all under Art. 1, Sec. 8, Cl. 15 of the U.S. Constitution. The only true money of the United States is the dollar of silver. Take note: the word “dollar” is used as a measure for silver. It is not a silver dollar, as almost all say. If one wants a reason to own gold and silver, both truly are the only lawful money of account of the United States today. The fiat paper “dollar’ was created by the Federal Reserve, and it is nothing more than a debt instrument. Debt never has nor never can be money. Debt is the antithesis of money, yet Americans, even the world, continue to believe that debt is money because they falsely believe that a Federal Reserve Note is a dollar. Why believe the truth when the lie “seems” much more credible? We had the tragedy in Orlando, where a Muslim gunned down over 50 people. Next day, Obama had the audacity to say, “We are to blame, not radical Islam.” Obama has said so many outrageous things during his eight years of lies, but this has to be the most offensive statements uttered by him. “We!! !” Surely he must be referring to the globalists that rule over him and this country, for there is not a single [non-politician] American that can be included as a part of the “We” he attributed for being responsible for the Orlando massacre. Is there any American listening to Obama that feels he or she is one of the responsible parts of his collective use of “We?” For all of the spying the NSA does on Americans, all under the auspices of making America safer from terrorists, said spying sanctioned and endorsed by Obama, how did this native Afghan killer escape detection? He was interviewed twice by the FBI, even placed on a terrorist “watch” list, yet no one from the all-spying government saw this coming. The NSA/FBI/TSA/Homeland Security, the entire collective of all corporate federal US agencies have not caught, stopped, or prevented any so-called “terrorist” act in this country. Do you need any better reason for owning gold and silver than to save yourself from this insidious federal government that only feeds itself at the expense of every day Americans? of their calling cards: “Do as we say, or you may be next.” Who killed Mrs Cox? Some so-called mentally disturbed individual who was a loner. What a coincidence with the BREXIT vote to be held on the 23rd of next week! Unlike the US, it is extremely difficult for an individual to own a gun or even a long-bladed knife. Both are against the law, yet this otherwise seemingly docile man with no known extremist associations or tendencies, and maybe mentally challenged [unknown for certain], owned both weapons. In an ironic twist, the vote for anti-BREXIT, [Britain leaving the EU] dropped to 32% from 40%, in a poll taken right after the death of Mrs Cox. Guess what? Even if BREXIT were to pass, by popular vote against the establishment, the vote is not legally binding on the establishment. It is merely “consultive.” Assume BREXIT passes. Before it ever can become binding, the British government will simply declare its passage may be too economically disruptive, and the government will decide not to go through with it. So much for people and their votes mattering. Do you need more reasons for buying and owning gold and silver to protect yourself from the rank greed and stupidity that runs every Western government? The stupidity is running rampant in Europe as US governor Chancellor Merkel exhorts Germany, indeed all of Europe, to accept the millions upon millions of Muslim migrants [can anyone confirm that their travel expenses are funded by Soros, we wonder?] that have and feel absolutely no allegiance and no desire to become a part of the culture of the host nations that accept them? What is wrong with the German people for tolerating the likes of Merkel who is out to destroy their identity, and she who says everyone should refrain from thinking of Muslims as being radical, terrorists, rapists, proven and not even potential threats to the local populations?! This is what the politically corrupt leaders of every Western nation are doing against the will of the people in order to further the will of the elites, destroying every sovereign nation and its people, in the process. Buy gold and silver, It is the most sane thing anyone can do in world gone, not going but gone amok. wealth-effect will be maintained to your benefit. Just keep accumulating and trust in the Force, as it were, to “coin” a phrase from Star Wars. If you do not have any, it will not matter. For those who do, it will be the difference potentially between surviving economic calamity or not. How many tones China or Russia are buying, or how many coins are being sold to the public each month will be of no consequence to what you personally own and hold. The only consequence that matters is the fact that you hold some. it may pay to rethink one’s objectives. Developing market activity “spoke” loudly, last week, when price rallied in a crescendo to the 1315+level before taking a dramatic turn below 1300 to 1280. That was a clear message from the market saying that sellers overwhelmed buyers, for the time being. Every market needs to undergo a correction to remain sustainable in a trend, and this one in gold is trying to establish itself. Thursday, it appears the market has reached at least a temporary turning point after a virtually uncorrected rally from 1200. The chart comments are worth review re that portion from the second half of May when volume increased substantially as price declined, yet, there was no further downside once price reached the support area at 1200. That apparent “selling” volume takes on a much different interpretation, as a consequence. Strong volume activity is always generated by smart money. The public have no ability to mount a collectively concerted buying or selling effort at one time in the market. Most of the volume increase occurred after the 1260 area was breached in mid-May, most likely weak hands stopping themselves out of the market on the decline or unable to maintain margin calls. Smart money took everything that was available for sale. It is why this observation is so key. If the situation, as described, is accurate, the lows at 1200 will be staunchly defended, and one can see from the 3 June sharp volume rally in a wide range bar up how easy it was to move price higher. The 50% retracement area is just a general guide to view as possible support, but it will be developing market activity that will be the best guide for determining if there is a buy area on the next correction. The only caveat is that price remains in a broad TR. 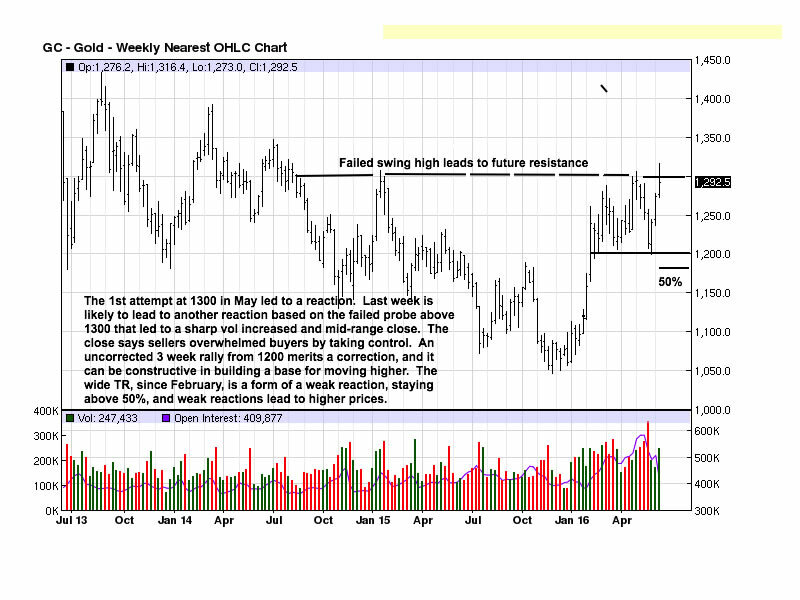 Silver still remains well under its Axis resistance at the 18.60 area. The fact that so many silver experts are calling for a screamingly bullish scenario in this market, a market that has yet to even challenge a major resistance hurdle, is the reason why we ignore all fundamentals, even from within the silver community because there is no pertinent timing advice to substantiate the silver-to-the-moon prospects. After such a strong rally effort, last week’s mid-range close is a red flag for being long the paper market. There will likely be some backing and filling in the week[s] ahead. We do not make for definitive statements or sensational “predictions,” not to be lacking in conviction or ambiguous but because we respect developing market activity, and while many people want concrete assessments, the markets are not so accommodative in function to be that “predictable.” Our posture is to maintain a healthy respect for the markets. Silver did not rally and spike above its May high, so Thursday’s what is likely to be a failed swing high will undergo corrective activity in the coming week[s] to continue base-building for what will eventually become a substantial move higher. Patience remains key. Our view remains unchanged: continue to buy and hold as much physical gold and silver as your situation/comfort zone allows. 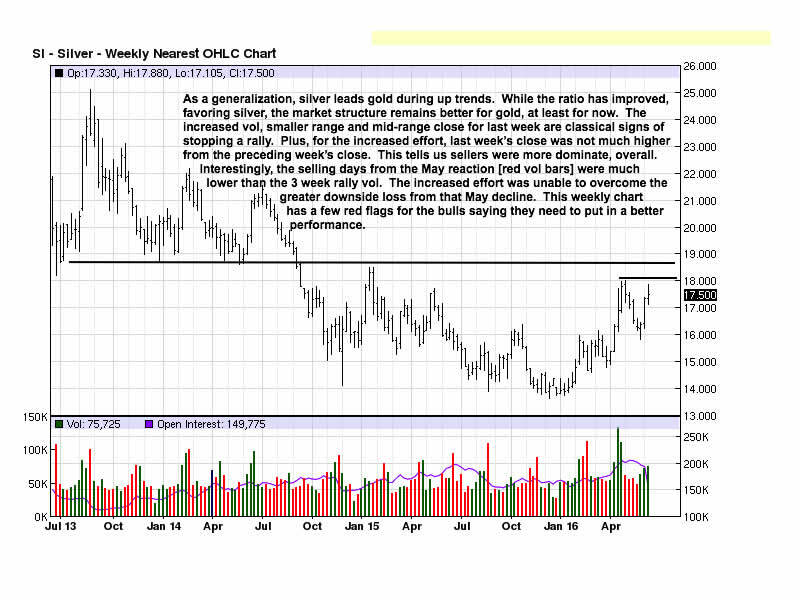 Silver should continue to outperform gold.